A new type K thermocouple conductor was jointly developed with a world-class manufacturer of thermoelectric wire to improve long-term stability and service life at elevated temperature in reducing atmosphere. AD-THERMIC is a MI thermocouple cable comprising of this advanced thermocouple conductor and Inconel 600 sheath with MgO insulation. 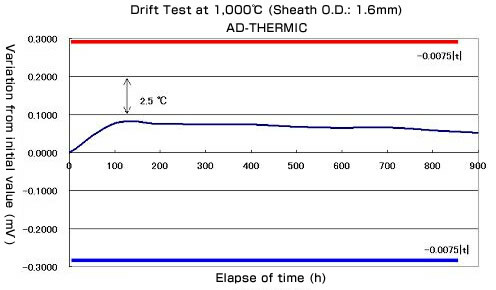 An excellent long-term stability and longer service life compared to the conventional MI thermocouple cables have been proven on our field test using heat treatment furnace and reducing furnace. Excellent long-term emf stability in hydrogen and carburizing atmosphere at elevated temperature. Prolonged service life in continuous operation.